Chinese demand for property in Spain has been growing strongly since 2013, but the last three quarters have seen the number of Chinese investors stagnating and even declining for the first time in years. What factors might explain this change in the trend? 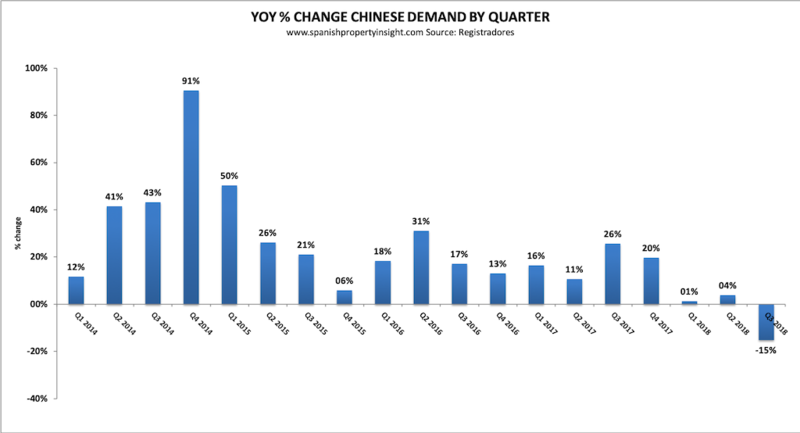 The graph above illustrates how Chinese demand has grown from 289 purchases to Q3 2013 to 626 in Q3 2018, though Q3 2017 was the peak in demand with 739 transactions, a 26% annualised increase at the time. 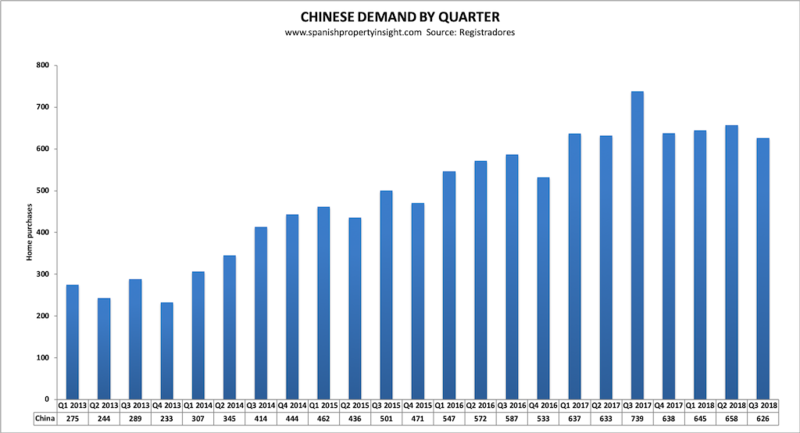 Since Q4 2017 Chinese demand has been stagnant or negative, with a 15% decline in Q3 2018, all according to the latest figures available from the Spanish Land Registrar’s Association. Compared to other foreign markets China was the one that declined the most in Q3 last year. 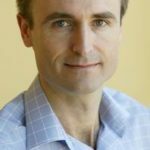 There are three factors I am aware of that help explain the lower interest from Chinese investors in the last three quarters for which data is available. First of all, the constitutional crisis in Catalonia, where separatists in control of the regional government have been trying to break away from Spain, will have undermined investor confidence. Chinese buyers are predominantly interested in Spain’s so-called ‘Golden Visa’ residency-by-investment scheme, and most of them head for Barcelona rather than Madrid, so the Catalan separatist drive adds an element of risk that foreign investors have to take into account. Chinese demand peaked in Q3 2017 just before the political situation in Catalonia turned ugly, so I think it’s likely that Chinese demand would have been stronger had the political situation in Catalonia been less alarming to foreign investors who don’t understand local politics. But local politics isn’t the only factor. Experts in Chinese demand I have talked to mention two other factors, namely a crackdown in China on taking capital out of the country, and increased competition in Europe for Golden Visa investors. Capital controls in China are not new. I think the authorities imposed a limit several years ago of something like €50,000 per person that can be taken out of the country, so one Golden Visa investor has to get a group of family and friends to club together and pool their allowances in order to reach the €500,000 level required to qualify for a Golden Visa investment in Spanish property. But I hear the Chinese authorities are making life more difficult for those trying to get money out of the country, and this might be reducing Chinese demand globally. The other factor I’m aware of is increased competition for Chinese investors from other EU countries offering Golden Visa schemes like Spain’s. I’m told that Greece has recently introduced a scheme that is similar to Spain’s but only requires an investment of €250,000 in property compared to Spain’s €500,000, making it more attractive for investors, and potentially more lucrative for those selling the scheme. Furthermore, property in Greece is cheaper than Spain, and Greek banks are far more lax about complying with money laundering rules than are Spanish banks. So if you are a Chinese investor looking for an EU Golden Visa with Schengen-area travel freedom then Greece looks like a better option right now. I’m told the Greek Golden Visa is so popular with Chinese investors right now that even air stewardesses on flights from China are touting them. I wouldn’t be surprised if there is a scandal involving the Greek scheme before long, at which point more the safer Spanish scheme will start to look more attractive again.